For my entire life, I have marched hand-in-hand with disadvantaged people everywhere. Whether it has been fighting for the rights of farm workers, or standing up for women’s rights, I refuse to ever be silenced when it comes to standing up for what is fair and just. Sometimes the injustice comes in a subtle form, just as toxic but harder to see. Today, a great source of injustice in our state is the commercial property tax loophole our state gives to millionaires, billionaires and big corporations. In 1978, Proposition 13 was passed to protect homeowners by limiting their property taxes from dramatically increasing over time, thereby protecting seniors, working families and young adults. However, the proposition also created a loophole allowing corporations the same rights that it affords homeowners — sound familiar? It allows corporations to claim the same protections for their commercial properties as homeowners receive for their homes. In turn corporations are able to avoid paying billions of dollars in property taxes – every year. Those billions of dollars are withheld from funding local health clinics, trauma centers, schools, libraries and other vital services our communities need and working families depend on to make ends meet. That is why I, and tens of thousands of California voters and organizations have come together to advocate for a fair and just fix. Our “Make It Fair” proposal seeks to close this $9 billion commercial property tax loophole by assessing commercial properties at their actual value. Right now, a majority of small businesses pay their fair share, but a small and powerful group of wealthy corporations don’t. Through this loophole they are able to maintain the myth that their properties have not increased in value since 1978. Our proposal closes the loophole while continuing to guarantee current protections for homeowners and renters – the Californians who actually need protections – and who were intended to receive them in the first place. I know firsthand what it is like to see your community, family and friends taken advantage of by billionaires and wealthy corporations. To see them starve and made sick at the expense of rising corporate profits. I know the impact of corporate loopholes and manipulation of the voters by these same corporations for their own gain. This is why I am proud to join this fight to close this commercial property tax loophole. Corporations are not the homeowners that were meant to be protected and it is time to stop treating them as such and make them pay their fair share. The people that I have fought for my whole life – farm workers, women, communities of color and working families in the Central Valley and beyond– have the deck stacked against them as it is. If you compound that by starving their local health clinics, trauma centers and schools of necessary funds, how are they ever going to have a chance at a better life? We’ve all heard a lot of fear mongering about this issue over the past 40 years, from corporations and out-of state investors who don’t have our communities best interests at heart. What they will not tell you is this simple truth: all homeowners including seniors, residential renters and farmers will continue to receive existing Prop 13 protections. So, too, will small businesses that will benefit from a level playing field. This is only about changing the commercial property tax loophole. The only ones who have anything to worry about are the millionaires, billionaires and big corporations currently profiting $9 billion a year from this loophole. From serving as an example in the fight against climate change, to leading the way on women’s empowerment, to having the most humane immigration policy in the nation, California knows what it takes to be a leader. It is time we become leaders against selfish corporations, who, like our president, get wealthier at the expense of hardworking Americans. It is time to put Californians first. Si se puede California, we can and will stand up for what is right! 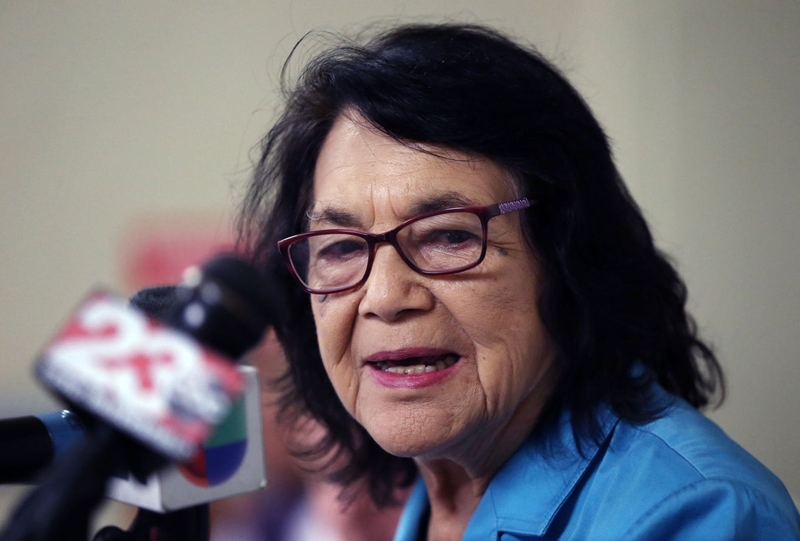 Dolores Huerta is a renowned labor and immigrant rights activist.